Everybody knows the Martini, right? Well, sort of. Everybody knows the name, but not everybody has sipped the classic version recently – if ever. Say “Martini” today, and your listener will probably imagine one of those “something-tinis” that just happen to be served in a martini glass. You know what I mean — drinks whose predominant flavor is apple or raspberry or chocolate or expresso. Even when people want to drink the “real” thing, they may order a vodka Martini. All those drinks may be good in their own way. But they aren’t the Martini. A real Martini — the Dry Martini — contains gin. No vodka. It also has enough dry vermouth so that you can taste it. And it may feature — get this — orange bitters (more about that in Notes). Fill mixing container half full with ice. Using a long-handled spoon (a bar spoon is ideal) stir vigorously for 20 to 30 seconds. Strain into a cocktail glass (preferably one that’s been chilled). Why Stir Rather than Shake? Stirring with ice somewhat dilutes the drink, which adds volume and an important dimension to the final flavor. 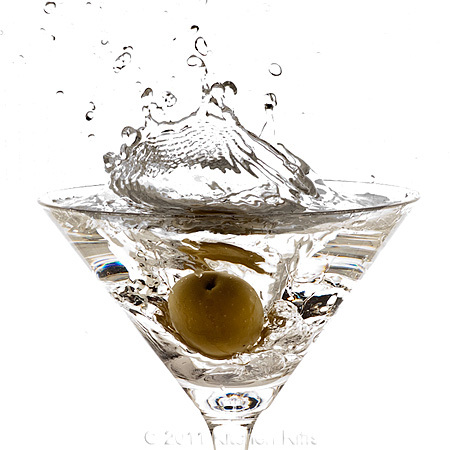 The Dry Martini is so called because it contains dry (white) vermouth. The classic Dry Martini of the 1920s and ‘30s was made with a ratio of 4 or 5 parts gin to 1 part vermouth. My own preference is 4:1, sometimes 3:1. This is very definitely a drink that you want to experiment with, to see how you prefer it. Although I call the Dry Martini the “real thing,” it’s not actually the original version of the drink. The earliest Martinis contained sweet (red) vermouth — and Old Tom gin, which had sugar added. Nowadays when we talk about the “dryness” of a Martini, we are referring to the quantity of vermouth the drink contains, not whether the vermouth is sweet or dry (it’s a given that it will be white vermouth). The less vermouth you use, the “drier” the drink. The original ratio of gin to vermouth was probably about 1:1. In the early 20th century, it became 2:1. The Martini continued to become drier over the years, topping out around 8:1. Winston Churchill famously took this to the limit: His preferred method for mixing a Martini was to pour a glass of gin — and observe a bottle of vermouth from across the room. Bitters were part of the drink from the beginning, but fell out of fashion around the late 1930s. I think it’s a tradition we should revive, since orange bitters go particularly well in a Dry Martini. They’re optional, of course, but I usually include them. There’s also a drink called the Hoffman House, which is a form of Dry Martini that specifically calls for orange bitters. It contains a larger quantity of bitters than the “classic” Dry Martini I describe here. The Martini is among the most celebrated of cocktails. So you can find plenty of information (both online and in print) about its history, the proper gin-to-vermouth ratio, how to mix it, and much else. I would recommend starting with David Wondrich, who is an excellent writer. His Martini discussion in The Esquire Drink’s Guide is well worth reading. My usual go-to drinks guide, DrinkBoy (Robert Hess) also has great Martini coverage. He offers several versions. I’m linking to his circa. 1900 martini recipe. He also has a great video on mixing the martini and a nice discussion on the proper ratio of gin to vermouth. 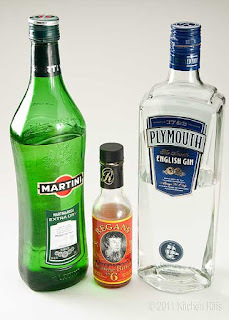 Although Plymouth is my gin of choice for the Martini, feel free to use whatever brand you prefer. I also like Beefeater gin for a Martini, or Bombay (their regular, less expensive formulation). Boodles is also nice. Noilly Prat is many enthusiasts’ vermouth of choice for the Martini — partly because it has excellent flavor, but also because it is contains less color than some other brands, thus imparting that translucent look that many drinkers prefer. I should note that within the past few years, Noilly Prat has changed the formula of the vermouth they sell in the United States. The new formula has more color to it, and a deeper flavor. (Actually, the formula isn’t really “new” — it’s the same version they’ve been selling for ages everywhere except the United States. They used to sell an altered formula here.) I like it. But a Martini made with the current Noilly Prat vermouth will have a little more color to it than formerly. I also like Martini & Rossi’s dry vermouth, which has always had a deeper color (and flavor). Speaking of vermouth, even though it’s fortified wine, it will spoil eventually. I always refrigerate mine after opening to prolong its life. Vermouth mixes extremely well with gin — which is why you use it in a Martini. The florals of gin and vermouth combine to form a unique flavor sensation, so you want to use a healthy slug of vermouth. Vermouth by itself is also a nice aperitif (while gin by itself is a bit hard to take, in my opinion). To my palate, vodka doesn’t mix all that well with vermouth. So if you want a vodka Martini, why not just change your order to straight vodka? Served chilled as a shot, or on-the-rocks? It’s a better drink, in my opinion. Speaking of on-the-rocks: You should never serve a Martini this way. 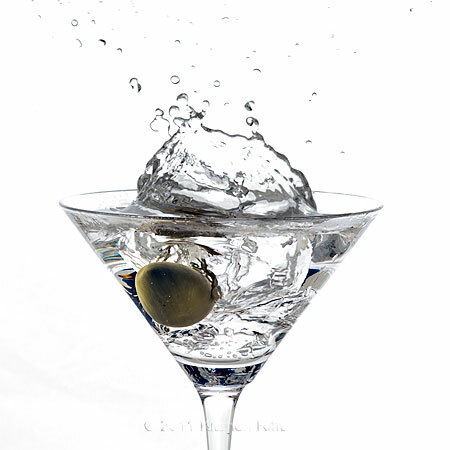 A Martini is always served “up” (mixed with ice and then strained into a glass). You want some dilution (which happens when you mix with ice) to temper gin’s flavor and kick — but not as much as you get when you serve the drink over ice. But you also want your Martini to be cold from first sip to last. So don’t be lured into ordering one of those supersized drinks that some of today’s establishments boast about serving. Unless you’re gulping your drink, you’ll find that the last few sips of those overlarge drinks warm up to the point where the drink tastes unpleasant. The original Martini was a small drink (slightly smaller than my recipe), and remained on the diminutive side through the 1950s and ‘60s. Those businessmen who indulged in the fabled three-Martini lunches actually consumed less alcohol than you’ll find in one of today’s monster cocktails. To many people, James Bond and the Martini fit together like a Walther PPK in a Berns-Martin holster. His immortal line, ”shaken and not stirred” is familiar to anyone who’s seen a Bond movie. Which is just about everyone. My recipe says stir, for reasons we’ve discussed. But Mr. Bond may have science on his side. There actually is medical evidence — in the form of a research paper published in the British Medical Journal — that suggests shaking Martinis may increase the antioxidant capacity of the alcohol. “I suppose this means you’ll be having another one,” replied Mrs. Kitchen Riffs. So I mixed myself a second drink. This time shaken - for medicinal reasons, of course. Found you on TasteSpotting. That is one gorgeous photo. Nice work. Hi Lynne and Rachel, thanks for the kind words regarding the photos. The drink is mighty good, too! Thanks for stopping by and commenting. How strong would one or two martinis be for a lightweight drinker? Oh my God! What a stunning photograph!! Looking forward to learning a lot from you on photography!! @Calvin, great question. The rule of thumb that I’ve seen frequently quoted for alcohol equivalency among different drinks is 1 ½ ounces of spirits (gin, vodka, bourbon, whatever) is roughly equal to a 12-ounce container of beer or a 4-ounce glass of wine. 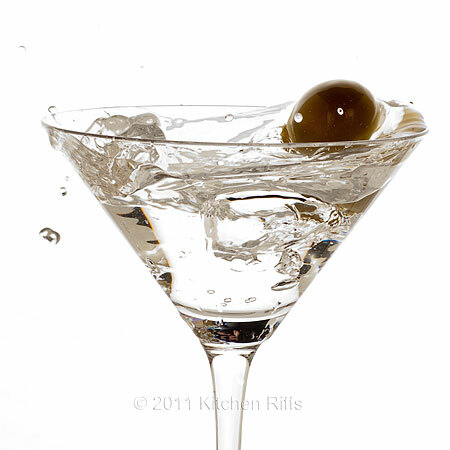 My Martini recipe calls for 2 ounces of spirits, plus the ½-ounce of vermouth has about twice the alcoholic content of wine – so I’m guessing a Martini made according to my recipe is the roughly the equivalent of somewhat less than 1 ½ beers or glasses of wine. If you want a smaller drink, I suggest 1 ½ ounces of gin with ½ ounce of vermouth – this would result in a drink slightly more alcoholic than a glass of wine, but because the gin/vermouth ratio is 3:1 would also taste a little less strong. You might also want to consider a Pimm’s Cup; the alcoholic content of this is a bit more than half a glass of wine, and it’s a delicious drink (a drink often associated with warmer weather, but really quite pleasant any time of the year). Let me know if you’d like additional info. Thanks for stopping by! @Purabi, thanks for those extremely kind words - I really appreciate them. Love the shots! And I love me some martinis. You've got me craving one right now! Hi Russell, thanks! Martinis are a great drink, aren't they? And remember - they have antioxidant properties! Thanks for commenting. Stunning, amazing photos!! Such cool shots. And I'm loving this martini recipe - I just bought Regan's orange bitters! Hi Katherine, thanks for the kind words re the photos. Delighted you bought the Regan's orange bitters! Let me know how you like them in a Martini. Thanks for your comment. What an interesting history of martinis! Thanks for sharing. Hi Beth, thanks for stopping by! I'm glad you enjoyed the historical notes on the Martini; a lot of cocktails have more history behind them than one would imagine, so it's always fun learning about them. Thanks for the comment. With the kind of day I'm having at work, this is order to try this evening. I've always been put off by vermouth even tho it's in our bar. One Q - how do I know if it's gone bad? Hi Denis, good question. The main thing that happens to a fortified wine - vermouth and sherry - is that exposure to light and/or oxygen causes it to deteriorate in flavor and color. It won't go "bad" in the sense that it will hurt you if you drink it; but over time the flavor and aroma will change, and it will lose its brightness and vitality. It won't taste awful; but it also won't taste very good. It doesn't turn to vinegar the way an open bottle of wine would; but it's getting there. I'd take a sip - if it has a nice mineral wine flavor, it's good. If it's unpleasant - well, I'd dump it out. And resolve to store my vermouth in the refrigerator in the future. Don't go through a bottle of vermouth that quickly? Use a little dry vermouth in place of white wine when cooking - it's a great substitute (use about 2/3 as much vermouth as you would wine). Hope this helps, and thanks for stopping by. Thank you for the very valuable information, not only knowing if the vermouth is useable but how to get a whole bottle used - in cooking. Great idea. Hi Denise, glad my response to your questions was useful. Using dry vermouth in cooking is something I remember hearing about from Julia Child. Makes sense - how many of use are going to open a bottle of wine when all we need is a quarter cup for a recipe? Thanks again. Hi Anonymous, thanks for the info about Dolin vermouth. I haven't tried it, but I'll be on the lookout for it and pick up a bottle to evaluate. Thanks for the comment. Just saw this recipe in the Gojee "Drinks Top Three" newsletter just delivered to my Inbox ... congrats on being featured there! I myself love a good gin martini ... though I need my olive juice to make it "dirty" ... there's just something about that combination that I love! Hi Kimberly, thanks! It's always fun being one of Gojee's Top Three. Dirty Martinis are pretty good, though I most frequently have the pristine "pure" version. And it has to be gin - vodka has its place, but it doesn't combine that well with vermouth, IMO, so I think it's a waste using it in a Martini - though obviously many people disagree. Thanks for commenting.